I was so taken with the look of the hake fillet at PE & DD in the Greenmarket today that I didn’t think about what I would do with it when I got home. Only when I had gotten there did I remember that all of the recipes I have used with hake involved a hot oven. While the temperature outside was as remarkably moderate today, I had no interest in spoiling the coolness of the evening by stoking a 400º stove. 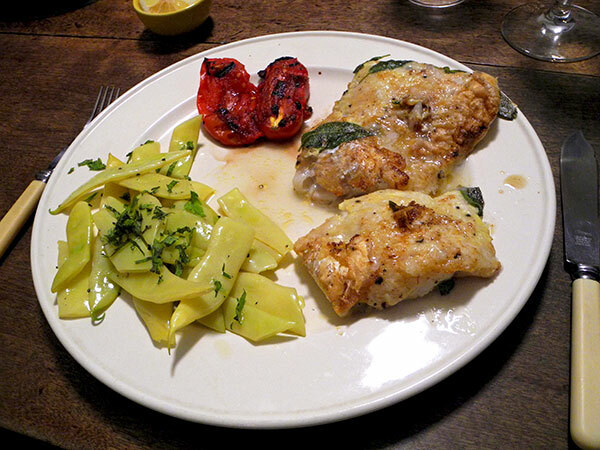 But hake is very similar to cod, and eventually I remembered a simple and delicious recipe which I’ve used with cod fillet: merluzzo dorato. I believe the hake version would be called nasello dorato in Italy, but, in any event, I can say for certain that it was a wonderful surprise: It was the most delicious hake entrée I’ve ever had. hake fillets from PE & DD, dredged in seasoned flour and dipped in a beaten egg from 3-Corner Field Farm, sautéed in butter along with a handful of sage leaves from Keith’s Farm, then sprinkled with lemon juice and the pan juices that remained. the wine was one of our favorite Spanish whites, Naia 2013 D.O.C. Rueda, from Verdejo old vines.